Topflex synthetic flooring comes in various thickness like 4.5mm, 5mm, 6.5mm and 7mm. 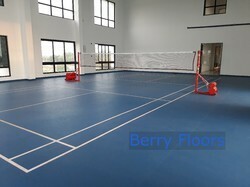 Berry Topflex synthetic flooring is being installed in various indoor badminton courts sucessfully in the last 6 years. Various colours are avaiable in synthetic flooring. Contact Berry Floors for your synthetic flooring requirement.